Default alignment, text font and size for the UIPickerView in iOS7. Note the centered appearance with equal padding from left and right. I was told that, changing parameters in Attribute Inspector (cmd + opt + 4 shortcut in XCode) did not make any difference. Well, I am not an expert in iOS but immediately I suspected that my friend overlooked to implement one of UIPickerView delegate methods. Basically — and I hope you understood that already — there is no way of customizing the look and feel of your iOS app without rolling your sleeves and getting dirty in coding UI properties. I.e., programatically define the way your UI should look like. Don’t get me wrong, doing things in XCode’s visual UI editor (former Interface Builder) is cool and, for the majority of simple applications, is quite sufficient. But simple is the keyword here. Once you want to go complex and adapt your UI depending on any constraints within the application logic, you have to do it programatically. With some exceptions on the bindings, maybe, but that’s another story. However, taking the programmatic approach has the added benefit of improved support for debugging. And this is a huge plus. Go and take a look at Apple’s UIPickerView class documentation and another look at UIPickerViewDelegate Class Reference and one final to UIPickerViewDataSource Protocol Reference. Don’t be fooled by what seem to be a modest number of methods of these classes. Make no mistake: UIPickerView inherits from UIView, thus all UIView‘s configuration methods also apply to UIPickerView. The amount of possible options provided by XCode’s Attribute Inspector is much less than what you can achieve programatically. And the massive customization that some application require, will implicitly require a programmatic approach. Go and right click on UIPickerViewDataSource and choose “Jump to definition” from the popup menu. You will be directed to UIPickerViewDataSource protocol. Ok, that’s it. All which is required (assuming you have connected the delegate and data source items within your controller class to the UIPickerView outlet) is to override these two delegate methods and you will get the app as in the picture above. // returns width of column and height of row for each component. // these methods return either a plain NSString, a NSAttributedString, or a view (e.g UILabel) to display the row for the component. // for the view versions, we cache any hidden and thus unused views and pass them back for reuse. Custom view for my UIPickerView. Note the font dimension, the alignment and left padding. Which is exactly what I wanted: to have a custom view in each row, left–aligned and padded to 20px from left margin of the UIPickerView. 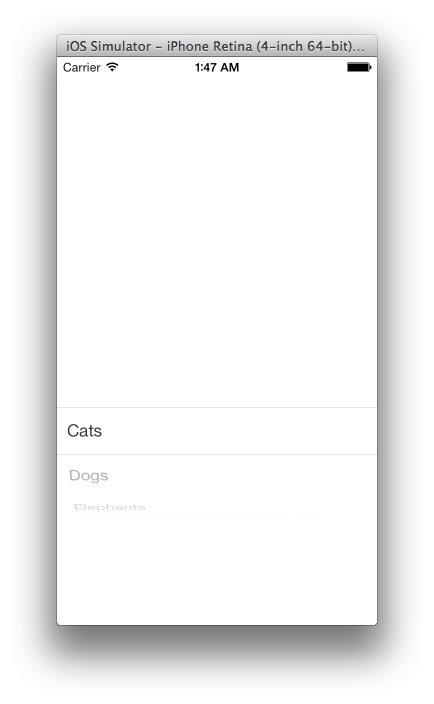 Ok, that’s for today: a very simple UIPickerView example. Next, we will enhance a bit our custom picker and add some more fancy logic behind. Stay tuned. Filed in Apple Programming, How To's, iOS, Most viewed and tagged Cocoa Touch, delegates, iOS, Objective-C, UIPickerView. Bookmark the permalink. How to Dismiss PickerView with Done button on UIToolBar? Unable to fire click event.please help. Hi, Niha, Thank you for your comment. I am not quite sure I understand your question. Could you elaborate a bit on your needs ? Will probably make the subject of a new post in this series. I’ve created a custom UIPickerView. I’ve added a UIToolbar with a UIBarButtonItem for the ‘done’ button on it. Now i want to hide picker and tool bar both on button(done button) click. It works in ios6 but in ios 7 it doesn’t. Hi, Niha. Thank you for these clarifications. It’s nice to see comments. Make me think my efforts are not in vain. Will post an update to this PickerView tutorial, covering this topic. Stay tuned. Thanks for your reply and i will stay tuned. You do a very good job of faking it! Stay tuned; looking forward for any comments or tutorial requests.